The Poet Laureate of Ce Soir Arts…Russell Eponym – Ce Soir Arts – Be inspired tonight! As you know, we’re a bit untimely with things due to Mireille having hurt her wrist. She’s doing well and you’ll soon hear from her again. Until then, I’ve been trying to keep up – or catch up. Some good things have come to Ce Soir Arts in the last couple of weeks, and one is a person who has come to sing or recite at Ce Soir Arts from our very first day: the beloved poet, musician, artist and actor, the inimitable Russell Eponym. As all his fans and friends do, Mireille and I have deeply valued knowing him for some time. His talents and intellectual acumen are keen and expansive; his personality gregarious and charming; and his kindness legendary. To say that we wanted – from the very first moment – to have Russell as our Poet Laureate and Artist-in-Residence would be an understatement, for there were many conversations about that very topic…we just didn’t ask – until recently. In his most gracious way, Russell kindly accepted. We were ebullient! So, Mireille set to work on a card and certificate to formalise it all, and she did a lovely job, as you will see below. AEON: Since we opened Ce Soir Arts in 2012, we’ve enjoyed many happy hours listening to Russell read, ruminate, and sing. Several of you have joined us for those hours and have been uplifted and encouraged, right along with us. Russell has a very special quality that we all admire; his many talents in music, poetry, and all the arts are a gift to him – and by his generosity – to us and to many others as well. MIREILLE: As we have enjoyed these hours, it came clear to Aeon and to me that we must formally honour Russell for his many accomplishments in the arts and in his work in SecondLife and at other grids across the metaverse. His history is rich with education and artistry, and his willingness to reach across the world to share such beauty is testament to his depth and caring as a person and as an artist. Therefore, today, we formally bestow upon him titles by which we have referred to him from the beginning. 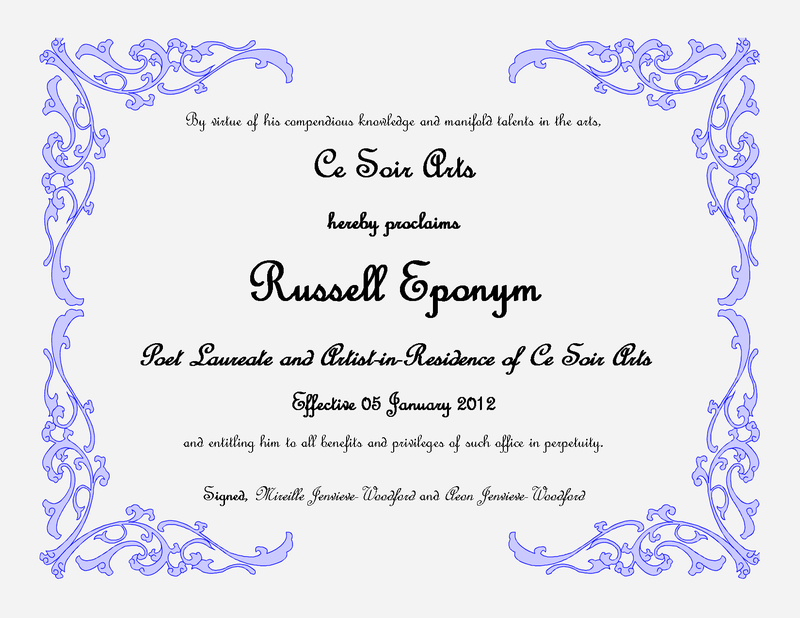 AEON: We welcome Russell now as the POET LAUREATE OF CE SOIR ARTS and as the ARTIST-IN-RESIDENCE here as well. Mireille has created a certificate for Russell that is contained in a card and she will now pass this to him with our deepest gratitude and respect. MIREILLE: Russell, you are indeed someone very special to all of us here today – and to every member of the wonderful Eponymous Family. At Ce Soir Arts, we hold you in the highest esteem, and hereby name you POET LAUREATE OF CE SOIR ARTS and as ARTIST-IN-RESIDENCE here. Thank you, dear Russell! Russell‘s gracious agreement and appreciation were expressed and cheers rose from the crowd. It was a fine moment at Ce Soir Arts, and one we shan’t ever forget! Now, we embark on more readings, ruminations, thoughts of the day, cherished musical interludes – as well as regular and delightful concerts with Russell. Indeed, Tuesdays and Thursdays are our favourite days at Ce Soir! Russell Eponym, Poet Laureate of Ce Soir Arts, will join us for an hour of reading, rumination, and song that will delight and educate. His extensive knowledge, kindly spirit, and lively wit and wisdom make every hour an unforgettable experience. Reading from an eclectic mix of some of the best poets and writers of all time, Russell keeps us in rapt attention. Sharing his own original writing, he brings us insight and enlightenment, as his Thought for the Day opens us to new ideas and dreams. Russell generally opens with a beautiful selection of music from across the artistic horizon and then brings out the guitar for an original song or two as well. Join us at The Magic Tree Reading Spot. It is magical! Next Three great shows – including dual-streaming – tonight!